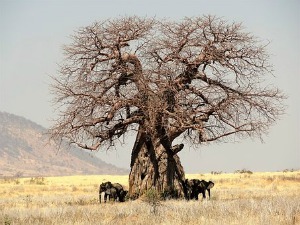 The fabulous Baobab oil comes from the fruit of Africa's majestic 'Tree of Life'. The tree is also often referred to as the upside down tree, because it looks as though it is growing its roots upwards. It is worth talking about the tree itself.........it grows up to 30 metres high, and its trunk can be up to 50 metres in diameter. It is believed that they can live to 6000 years. The Baobab stores water in its massive trunk.......up to 100,000 litres, so it is able to produce a nutrient dense fruit in the driest seasons. I have never tasted the fruit, but apparently it has a pleasant, sour taste - very popular with the children! The trees can provide shelter, water and a superfood fruit for animals and humans. In Africa the tree really is a symbol of life. What an amazing tree.........and from the seeds of the fruit comes the truly amazing baobab oil with its many, many health benefits. Look out for the best oils which are cold pressed from the seeds. I love this unique oil and have started including it more and more in my natural skincare products. A deep golden yellow to orange colour with light to medium viscosity and a unique nutty and earthy aroma. It is absorbed quickly and is an excellent moisturiser for the skin, especially dry and rough skin. It is rich in vitamins A, D, E and F - great for firm skin and neutralising free radicals. It contains Omega 3,6 and 9 - very important as they aid cell regeneration and are therapeutic for eczema, psoriasis, rosacea and acne. This oil has potent anti-oxidant properties which help reduce fine lines and wrinkles and fight the signs of ageing. Its anti-oxidant properties help protect the oil itself from oxidising and so increases its stability and shelf life. Known for its skin softening and healing properties. Great as a massage oil, especially for dry and damaged skin. It leaves the skin feeling silky and smooth - wonderful! Can be used topically for stretch marks. Used regularly and it can help reduce the appearance. Fantastic for chapped lips - apply a small amount to your lips and see the results..
Use as a moisturising oil after a shower - it will not leave you feeling greasy. Add a small amount (roughly 1%) to your shampoo for a hair nourishing experience. Can be used in soaps, creams, lotions and many aromatherapy recipes. It is slightly more expensive than other vegetable oils such as sweet almond and grapeseed oils, but it is well worth paying the extra for something a little more special. It has a shelf-life of about 18 to 24 months. 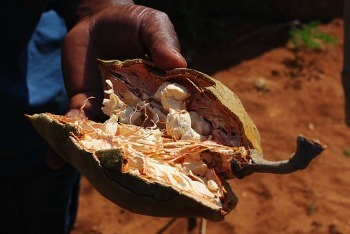 Women in Africa have used the baobab fruit as a source of natural beauty and health for centuries. The oil is used in Africa to protect the skin against the harsh savanna conditions. Baobab oil should only be used topically on the skin. It is not suitable for drinking or oral consumption.